An injunction is an equitable remedy in the form of a court order that requires a party to do, or to refrain from doing, certain acts. A party that fails to comply with an injunction faces criminal or civil penalties and may have to pay damages or accept sanctions. In some cases, breaches of injunctions are considered serious criminal offenses that merit arrest and possible prison sentences. Emergency injunctions that are in effect only a short time are called temporary restraining orders. Courts can also issue preliminary injunctions to take effect immediately and effective until a decision is made on a permanent injunction, which can stay in effect indefinitely or until certain conditions are met. Every court is constituted for the purpose of administering justice among particles and there’re, must be deemed to possess all such powers as may be necessary to do full and complete justices to the parties before it. It is a well settled principle of law that interim relief can always be granted in the aid of and as ancillary to the main relief available to the party on final determination of his rights in a suit or any other proceeding. Therefore, a court undoubtedly possesses the power to grant interim relief during the pendency of the suit. Temporary injunctions are thus injunctions issued during the pendency of proceedings. An injunction is a judicial process whereby a party is required to do, or to refrain from doing, any particular act. It is a remedy in the form of an order of the Court addressed to particular person that either prohibits him from doing ‘or continuing to do a particular act (prohibitory injunction); or orders him to carry out a certain act (mandatory injunction). The primary purpose of granting interim relief is the preservation of property in dispute till legal rights and conflicting claims of the parties before the court are adjudicated. In other words, the object of making an order regarding interim relief is to evolve a workable formula to the extent called for by the demands of the situation, keeping in mind the pros and cons of the matter and striking a delicate balance between two conflicting interests, i.e., injury and prejudice, likely to be caused to the plaintiff if the relief is refused; and injury and prejudice likely to be caused to the defendant if the relief is granted. The court in the exercise of sound judicial discretion can grant or refuse to grant interim relief. The underlying object of granting temporary injunction is to maintain and preserve status quo at the time of institution of the proceedings and to prevent any change in it until the final determination of the suit. It is in the nature of protective relief granted in favour of a party to prevent future possible injury. The need for such protection, however, has to be judged against the correspond­ing need of the defendant to be protected against injury resulting from exercising his own legal rights. The court must weigh one need against another and determine where the balance of convenience lies and may pass an appropriate order in exercise of its discretionary power. Injunctions are of three kinds: (i) temporary; (ii) permanent and (iii) mendatory. A permanent Injunction restrain a party forever from doing the specified act and can be granted only on merits at the conclusion of the trial after hearing the both party to the suit. It is governed by the Sections 52 to 57 of the Specific Relief Act, 1877. A temporary or interim injunction on the other hand restrains a party temporarily from doing the specified act and can be granted only until the disposal of the suit or until the further order of the Court. Regulated by the provision of the Order 39 of the Code of Civil Procedure, 1908 and may be granted at any stage of the suit. Injunctions are also (i) preventive, prohibitive or restrictive, i.e. when they prevent, prohibit or restrain someone from doing something; or (ii) mandatory, i.e. when they compel, command or order some person to do something. According to Section 53 of the S.R Act, a perpetual injunction can only be granted by the decree made at the hearing and upon the merits of the suit; the defendant is hereby perpetually enjoined from assertion of a right, or from the commission of an act which would be contrary to the rights of the plaintiff. Injunction is a specific relief which is of two kinds – (i) perpetual injunction which is dealt with in ss.54 to 57 of the Specific Relief Act and (ii) temporary injunction dealt with under Or 39 of CPC. The principles governing the grant of perpetual injunction are applicable in respect of passing of orders of temporary injunctionand if in a suit a decree of perpetual injunction cannot be granted, no temporary injunction should ordinarily be granted under this Order in that suit.Thus where a building contractor whose services had been terminated is not entitled to a decree of specific performance of his contract of employment as it is one based on personal skill, no temporary injunction can be issued in such a case. In view of the provision of s.56 (d) of the Specific Relief Act, no injunction can be issued when it will have the effect of interfering with the public duties of any department of the Government.5 An applicant will not be granted temporary injunction if he has no personal interest in the matter as required by s.56 (k) of the Specific Relief Act.However, the power of the court to grant temporary injunction is not limited to cases where perpetual injunction can be granted. On the other hand, the court will not issue temporary injunction merely because ultimately a decree for perpetual injunction can be granted as for issue of temporary injunction there is the further question of irreparable loss and balance of convenience. According to Section 54 of the S.R. Act, subject to the other provisions contained in, or referred to by this chapter, a perpetual injunction may be granted to prevent the breach of obligation existing in favour of the applicant, whether expressly or by implication. When such obligation arises from contract the court shall be guided by the rules and provisions contained in the chapter II of this Act. ii) Contracts which can not specifically be enforced. a) Where the defendant is trustee of the property for the plaintiff. a) A trustee threatens a breach of trust. His co-trustees if any should and the beneficial owner may sue for an injunction to prevent the breach. In the course of A’s employment as a vakil, certain papers belonging to his client, B come into his possession. A threatens to make this papers public, or to communicate there contents to a stranger. B may sue for an injunction to restrain A from so doing. A, is B’s medical advisor. He demands money for which B declines to pay. A then threatens to make known effect of B’s communications to him as a patient. This is contrary to A’s duty and B may sue for an injunction to restrain him from so doing. A, the owner of certain houses in Dhaka becomes insolvent. B buys them from the official assigned and enters into possession. A persists in trespassing on and damaging the houses and B is thereby compelled, at considerable expenses to employ men to protect the possession. B may sue for an injunction to restrain further acts of trespass. e) Where the injunction is necessary to prevent a multiplicity of judicial proceedings. A pollutes the air with smoke so as to interfere materially with the physically comfort of B and C, who carry on business in a neighboring house. B and C may sue for an injunction to restrain the pollution. For the purpose of the section a trade mark is property. In the absence of the above mentioned ground perpetual injunction will not be granted. According to section 55 of the S. R. Act–when, to prevent the breach of an obligation, it is necessary to compel the performance of certain acts which the court is capable of enforcing, the court may in its discretion grant an injunction to prevent the breach complained of, and also to compel the performance of the requisite act. A, by new buildings, obstructs lights to the access and use of which B has acquired a right under the Limitation act, 1908. B may obtained an injunction, not only to restrain A from going on with the buildings, but also to pull down so much of them as obstructs B’s light. Every court is constituted for the purpose of administering justice between the parties and therefore, must be deemed to process all such powers as may be necessary to do full and complete justice to the parties before it. It is a well stated principle of law that an interim relief can always be granted in the aid of and as ancillary to the main relief available to the party on final determination of his rights in a suit or any other proceeding therefore, a court undoubtedly processes the power to grant interim relief during the pendency of the suit. 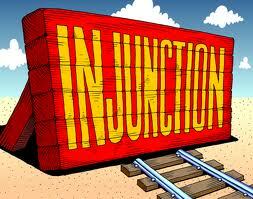 An injunction is a judicial process whereby a party is required to do or to refrain from doing any particular act. Temporary injunction is mode of granting preventive relief by the court at its discretion. A temporary injunction is also known as interim injunction. According to order 39 of the CPC any order made temporarily prohibiting the defendant not to alienate, or to change or to damage the property in dispute during the pendency of the suit is called temporary injunction. According to section 53 of the S. R. Act, temporary injunctions are such as are to continue until a specified time, or until the further order of the Court. They may be granted at any period of a suit and are regulated by the Code of Civil Procedure, 1908. Thus temporary injunction is regulated under the provisions of rules 1-5, order 39 of the Code of Civil Procedure, 1908. The purpose of granting interim relief is the preservation of property in dispute till legal rights and conflicting claims of the parties before the court are adjudicated. The underlying object of granting temporary injunction is to maintain and preserve status quo at the time of institution of the proceedings and to prevent any change in it until the final determination of the suit. where the court is of the opinion that the interest of justice so requires. The relief of temporary injunction is generally prayed for by the plaintiff. But in an appropriate case the defendant may also pray for and obtain an order of temporary injunction against the plaintiff. Thus in the plaintiffs suit for specific performance of contract of a transfer, on the prayer of the defendant, the plaintiff may be restrained from raising structure on the suit land by temporary injunction. The defendant can apply for temporary injunction against the plaintiff only if the relief claimed by the defendant arises out of the plaintiff’s cause of action or is incidental thereto. Thus, injunction restraining the plaintiff from parting with possession of vacant portion of the disputed premises to the purchaser until the disposal of the appeal may be granted. It is not the plaintiff alone who can apply for an interim injunction. A defendant also may make an application for grant of an injunction against the plaintiff. An injunction may be issued only against a party and not against a stranger or a third party. It also cannot be issued against a court or judicial officer. Normally, injunction can be granted against persons within the jurisdiction of the court concerned. The relief of temporary injunction is an equitable relief and it is not granted where the pan applying for temporary injunction does not come with clean hands. A dishonest litigant loses his remedy when he is guilty of misrepresentation or concealment of material facts. Temporary injunction shall not be granted in favour of a person in unauthorised possession. But where the applicant has been in possession of the property in suit for sometime and claims title on the basis of some documents, the question whether he is a trespasser will be decided at the trial.Injunction will not be granted in support of illegal or unauthorized act. The court may also refuse temporary injunction on the ground of delay, laches or acquiescence. The court is to take into consideration the effect of issuing temporary injunction on third Thus where the plaintiff is a regular supplier of hospital goods to the Government, but its registration was not renewed on account of failure of the plaintiff to comply with certain formality as a result of which the Government invited open tenders and tenders from certain other suppliers were offered and the plaintiff filed a suit and obtained interim injunction restraining the Government from accepting other tenders, the High Court set aside the order of injunction holding that the interest of other suppliers who submitted tenders for supplying goods cannot suffer for no fault of their own and by granting injunction the court cannot put the other intending suppliers to great inconvenience. According to section 22 of S.R. Act, the jurisdiction to decree specific performance is discretionary, and the Court is not bound to grant such relief merely because it is lawful to do so; but the discretion of the Court is not arbitrary but sound and reasonable, guided by judicial principles and capable of correction by a Court of appeal. The grant of temporary injunction is discretionary with the court and a party cannot get the relief as a matter of course. It shall not be granted merely because it is lawful to do so. It is a power of extraordinary nature and the court is to exercise the power with caution and great circumspection. Where the trial court as also the appellate court did not grant injunction and in the revision filed three months after the order of the appellate court the High Court Division granted interim injunction ex pane the Appellate Division held it to be not a proper exercise of the discretion. The court shall grant the relief only when it is satisfied that the applicant will suffer irreparable loss or injury if the other party is not restrained as prayed for. The court should always be willing to extend its hands to protect a citizen who is being wronged or is being deprived of any property without due course of law, but at the same time the judicial proceedings cannot be used to protect or perpetuate a wrong committed by a person who approaches the court. The same consideration applies when the other party applies for vacating the interim relief granted by the court.The discretion has to be exercised on sound judicial principles and not arbitrarily. Where the court did not take into consideration material points involved in a case, the discretion has not been properly exercised.The appellate court’s interference with the exercise of such discretion is also governed by equitable principles and the appellate court will not interfere unless it is found that the trial court has exercised the discretion arbitrarily or fancifully. Where temporary injunction was granted by the courts below, the order cannot be disturbed in revision without taking into consideration the findings of fact on the basis of which it was passed. Where the appellate court set aside the order of the trial court omitting to consider the material points, the trial court’s order was restored When on consideration of the materials on record discretion was exercised in favour of granting injunction, it was not interfered in revision and the Appellate Division refused to grant leave. The Appellate Division is reluctant to interfere with an interlocutory order passed by the courts below. Against whom injunction can be granted. An injunction can be issued only against party to the suit and not against a stranger or against a court. In a proper case an injunction may be issued even against a person outside the jurisdiction of the court. No injunction will ordinarily be issued against government officer’s bona fide exercising rights or alleged rights in the course of their duty, or against public bodies under similar circumstances. Ordinarily, an order of injunction binds the parties to the suit. It is also binding on the agent or servant of the defendant.’ Persons who were not party to the suit nor were named in the injunction order cannot be proceeded against for violation of the order of injunction. But a person who is aware of an order of injunction is bound to obey even though he was not a party to the suit when it affects the result of the earlier order. Thus when the Appellate Division passed an order for maintenance of status quo in respect of composition of the Board of Directors of a bank and when a copy of the order was sent to Bangladesh Bank by that bank, Bangladesh Bank was bound to honour the order of the Appellate Division. The power to grant a temporary injunction is at the discretion of the court. This discretion, however, should be exercised reasonably, judiciously and on sound legal principles. Injunction should not be lightly granted as it adversely affects the other side. The grant of injunction is in the nature of equitable relief, and the court has undoubtedly power to impose such terms and conditions as it thinks fit. Such conditions, however, must be reasonable so as not to make it impossible for the party to comply with the same and thereby virtually denying the relief which he would otherwise be ordinarily entitled to. Generally, before granting the injunction, the court must be satisfied about the following aspect. A relief of temporary injunction cannot be granted just for the mere asking of it after filing of a suit without adverting to the principles governing the grant of temporary injunction. Before an order of temporary injunction may be passed, the court must be satisfied that the applicant has a prima facie and arguable case to go into trial that the applicant shall suffer irreparable injury or loss unless the injunction is granted and that the balance of inconvenience is in favour of the applicant. Where the applicant fails to make out a prima facie case, the question of irreparable injury and balance of inconvenience does not arise and non-consideration of the points of irreparable loss and balance of inconvenience is not material. In the case of a temporary injunction, the applicant must show (a) a prima facie case in support of the right claimed; (b) an actual or threatened violation of that right; (c) productive of irreparable or at least serious damage; (d) his conduct must be such as not to disentitle him to assistance but it should be fair and honest and in particular there must be no acquiescence or delay; (e) there must be a greater convenience in granting than refusing the injunction, and (f) equally efficacious relief must not be obtainable by any other usual mode or proceeding. Prima facie case, however, should not be confused with a case proved to the hilt. It is no part of the court’s function at that stage to try neither to resolve a conflict of evidence nor to decide complicated questions of fact and of law which call for detailed arguments and mature considerations. These are matters to be dealt with at the trial. (Emphasis supplied) In other words, the court should not examine the merits of the case closely at that stage because it is not expected to decide the suit finally. In deciding a prima facie case, the court is to be guided by the plaintiff’s case as revealed in the plaint, affidavits or other materials produced by him. Explaining the ambit and scope of the connotation “prima facie” case, in Martin Burn Ltd. v. Banerjee, the Supreme Court observed, 42 DLR. “A prima facie case does not mean a case proved to the hilt but a case which can be said to be established if the evidence which is led in support of the same were believed. While determining whether a prima facie case had been made out the relevant consideration is whether on the evidence led it was possible to arrive at the conclusion in question and not whether that was the only conclusion which could be arrived at on that evidence. It may be that the tribunal considering this question may itself have arrived at a different conclu­sion. It has, however, not to substitute its own judgment for the judgment in question. It has only got to consider whether the view taken is a possible view on the evidence on the record. In order to get an order of temporary injunction, the applicant must make out a prima facie case in support of the right claimed by him. The existence of a prima facie right and infraction of such right is a condition precedent to the grant of temporary injunction. The burden is on the applicant to satisfy the court by leading evidence or otherwise that he has a prima facie case in his favour. The case must be established with sufficient material or proved by affidavit. The view that to establish a prima facie case it is not necessary to file documents or papers and it can be spelt out in the plaint is not correct. Where the impugned order of ad interim injunction does not show that there is a prima facie case in favour of the plaintiffs, the order suffers from non-application of judicial mind. In explaining what is meant by prima facie case, the High Court Division observed that it is a well-established principle of law that in order to get an order of temporary injunction, the plaintiff has to show that he has a good prima facie case meaning thereby that a serious question of law is to be tried in the suit. The court must be satisfied that there is a bonafide dispute raised by the applicant, that here is a strong case for trial which needs investigation and a decision on merits and that on the facts before the court there is a probability of the applicant being entitled to the relief claimed by him. A plaintiff in possession of the suit land has a prima facie case for injunction and the validity of the claim of title will have to be gone into in trial. Where license is cancelled without giving any opportunity of hearing, a prima facie case is made out. A prima facie case should not be confused with a case proved to the hilt. “Prima facie case is not to be confused with prima facie title which has to be established on evidence at the trial. A prima facie case alone is a substantial question raised, bona fide, which needs investigation and a decision on merits.” It is no part of the court’s function at that stage to try to resolve conflict of evidence, nor to decide complicated question of fact and of law which called for detailed arguments and mature consideration. These are matters to be dealt with at the time of trial. The court is not required to enter into the merit of the case as is necessary for passing a decree after hearing the evidence. The applicant has to show that a fair and arguable case exists in his favour. While determining whether a prima facie case had been made out, the relevant consideration is whether on the evidence or materials brought before the court it is possible to arrive at a conclusion in question and not whether that is the only conclusion which could be arrived at on that evidence or materials.An applicant is not required to make out a clear legal title, but to satisfy the court that he has a fair question to raise as to the existence of the legal right which he sets up, and that there are substantial grounds for doubting try existence of the alleged legal right, the exercise of which he seeks to prevent. In Mizanur Rahman v. Serajuddin, 37 DLR the High Court Division observed that ordinarily the acts which are sought to be restrained by injunction are those which are prima facie illegal or with respect to the legality of which there appears to be reasonable doubt in the mind of the court. The court further observed that the right that the plaintiffs want to assert in support of their claim must be a legal right and the injury that they allege must be a legal injury. However, the Appellate Division observed that the expression ‘legal injury’ should be avoided for a clearer expression; in order to get temporary injunction the applicant must claim a legal right and allege an injury which is not ordinarily reparable by monetary compensation. Plaintiffs who applied for lease of a vested property cannot obtain temporary injunction to restrain lease of the vested property to a third party. Temporary injunction or ad interim injunction cannot be granted where the plaintiff has no subsisting interest in the suit property. Where the lease for a short period expires, the lessee cannot have any subsisting right in the suit property and have no prima facie case for injunction. A plaintiff not being in possession for a long time or a plaintiff claiming through a lease from Shebait who had no authority to lease out has no prima facie case for injunction. Where a plaintiff seeks injunction restraining dispossession, he must produce some evidence of possession by him. Temporary injunction cannot be granted when it would lead to interference with and ultimately frustrate an order of the court passed under s.9 of the Specific Relief Act. Granting of injunction is an equitable relief and such a power can be exercised when judicial intervention is absolutely necessary to protect rights and interests of the applicant. The expression irreparable injury however does not mean that there should be no possibility of repairing the injury. It only means that the injury must be a material one, i.e., which cannot be adequately compensated by damages. An injury will be regarded as irreparable where there exists no certain pecuniary standard for measuring damages. An applicant is not entitled to an order of temporary injunction merely by making out a prima facie case. He must also show that he shall suffer irreparable loss or injury not commensurable in monetary terms unless the other party is restrained. The court must be satisfied that refusal to issue injunction would result in an irreparable loss or injury and he needs be protected from the consequence of the loss or injury. When a threatened injury is one of pecuniary loss and may be compensated in monetary terms, the court will be slow to grant temporary injunction. The expression ‘irreparable injury’ does not mean that there should be no possibility of repairing the injury; it only means that the injury must be a material one which cannot be adequately remedied or compensated by damages. It does not mean an injury which is not physically capable of being remedied but one which cannot adequately be remedied by damages. The applicant is to show that the injury is such that the court would not be able to put him status quo. Where damages can furnish adequate remedy, an injunction should be refused.” In a suit for specific performance an order restraining alienation of immovable property is unnecessary in view of the safeguard of s.52 of the Transfer of Property Act, but an injunction may appropriately issue in such a suit where it is shown that damages for breach of the contract would not be an adequate remedy. Availability of adequate remedy in money terms is an impediment in obtaining order of temporary injunction, but injunction against a newspaper restraining it from publishing or continuing to publish defamation cannot be refused on the ground that loss of reputation can be adequate compensated by damages. The applicant must show a clear necessity for affording protection to his alleged right, which would otherwise be seriously impaired. Before granting temporary injunction, the court must also be satisfied that the balance of inconvenience is in favour of the applicant. It means that the court is to be satisfied that the comparative mischief, hardship or inconvenience which is likely to be caused to the applicant by refusing the injunction will be greater than that which is likely to be caused to the other party by granting it. Temporary injunction likely to cause mischief cannot be granted when it is clear that grant of temporary injunction will tell upon the internal management of an educational institution. In matters of service the court has also to keep in view the difficulties and problems that are likely to be created in the matter of administration in a particular office or organisation before allowing the prayer for temporary injunction. The court while exercising the discretion should be guided by the sound judicial principles and should attempt to weigh substantial mischief or injury likely to be caused to the applicant, if the injunction is refused and compare it with that which is likely to be caused to the opposite party if the injunction is granted. On weighing the conflicting probabilities, the court will grant the relief if in its opinion the balance of inconvenience is in favour of the applicant, e.g. if the mischief to the applicant is greater than the mischief to the opposite party. The balance of inconvenience rule has no place where the applicant’s right is doubtful or where he can be compensated in money terms. No injunction will be issued when on consideration of the balance of inconvenience it is found that it would be oppressive to the defendant to issue the injunction. The principle of balance of inconvenience applies when the scales are evenly balanced. No injunction should be granted which will interfere with development work with aid. In a case where national interest outweighs personal interest/gain or profit or in other words, where national loss because of an order of injunction would outweigh the individual loss, the prayer for injunction is certainly merit less. When the allegations made in the application are vague or indefinite, no injunction can issue. Equally, no injunction should issue in respect of a property description of which is vague and not specific. In order to get an order of injunction, the property in dispute should be clearly identified with specific area and demarcation. In a suit for declaration of title and partition, the decree holder cannot be restrained by injunction; the proper course would be to pray for stay of further proceedings if the decree is put into execution. No injunction can be granted in matters covered by a provision made in a special enactment. Injunction cannot be granted when it interferes with performance of public duties. As earlier stated, temporary injunction is to be refused where no relief of permanent injunction can be granted.Temporary injunction is not to be granted when the order would be infructuous as the act sought to be restrained has already been done.No injunction is to be passed when the suit is prima facie barred by limitation as in such case the plaintiff cannot have a. prima facie case. The jurisdiction of granting injunction being an equitable jurisdiction, no injunction should be granted at the instance of the party who has not come with clean hand. The power of granting injunction should not be exercised when other equally efficacious remedy is available. No interim injunction can be granted when the suit is found prima facie barred by res judicata. However, in some decisions contrary view was taken laying down that at the interlocutory stage the court is only to consider whether triable issues have been raised by the plaintiff and whether there are substantial questions which need be investigated.It is submitted that where there is no doubt about the application of res judicata it cannot be said that the applicant has a prima facie case. On the other hand, when an applicant’s possession had been found in a previous litigation, he may be entitled to an order of injunction on the strength of the previous finding. Similarly, when in a previous litigation A has been found to be the true owner of the disputed property and not B, B cannot obtain an order temporary injunction against A. In view of the earlier decision in writ petition that the plaintiff had no title, his claim for temporary injunction in respect of the suit land is not maintainable. It has been held that the court is not required to look into maintainability of suit at the time of hearing injunction matter; it is to be decided after filing of the written statement and framing issue on the point. In another case, the same view has been taken that maintainability of a suit should not be gone into at the interlocutory stage particularly when there will be necessity of evidence at the trial of the suit for correctly deciding the issue. It is submitted that the principle is too broadly stated. It is true that the question of maintainability will have to be deferred when further evidence is required to decide the issue, but there may be cases where on the very face of it the suit is not maintainable and there cannot be any question of issuing temporary injunction. A plaintiff cannot have a prima facie case where the suit is ex facie not maintainable. In deciding an application for temporary injunction admission made by a party in an earlier proceeding may be taken in its face value and if such admission demolishes the case of the applicant, temporary injunction cannot be granted. Where the plaintiff has on his own showing made a transfer of the land before completion of his own settlement, he having parted with the land cannot get an order of temporary injunction to protect his alleged possession. An order of temporary injunction under this Order can be granted where (i) the property in dispute is in danger of being wasted, damaged, alienated or wrongfully sold in execution of a decree, (ii) the defendant threatens or intends to remove the property to defraud his creditors, (iii) the defendant is about to commit a breach of contractor other injury of any kind ‘ or where the court is of the opinion that the interest of justice so requires. The property in respect of which an order of injunction can be passed must be the property which is directly in dispute in the suit and no other property, nor where the property in dispute is indirectly affected. In order to obtain an order of injunction relating to an immovable property, it must be distinctively specified so that it can be clearly identified. To obtain injunction the applicant must have subsisting interest in the property in dispute.Where the defendant is in possession of the suit property claiming title, he can be allowed to change the nature and character of the property if it does not diminish the value of the property and he can make construction on the property at his own risk and he cannot be restrained. One cannot get an injunction to restrain a man who is alleged to be a debtor from parting with his property. Contract of sale does not create any title to the vendee and hence a transferee under a sale deed cannot be restrained from enjoying possession of the property at the instance of a person claiming to have a previous agreement of sale in his favour. Defendant in a suit for specific performance may be restrained from transferring the suit property and making construction thereon by a third party during the pendency of the suit. However, it has been held that in a suit for specific performance an order of injunction restraining alienation is unnecessary as s.52 of the Transfer of Property Act is an adequate safeguard. Favour by making the construction and the court would not in equity order demolition of the construction. The Appellate Division subsequently distinguished those cases and held that a cosharer cannot be permitted to go on making construction where he is possessing land in excess of his share. In Hashem Ali v. Begum Nurjahan, 9 MLR the Appellate Division held that the principle that in urban area no cosharer should be restrained by injunction from making construction is not applicable where the very right to construct is based on a deed which is tainted with fraud. Where a co-owner inducted a tenant in the premises without the consent of the other co-owner and the tenant runs a workshop without permission and license from Municipal Corporation, the court may restrain the tenant from running a workshop in the premises. Where the stranger purchaser files a suit for permanent injunction in respect of an ejmali property and sought temporary injunction, it was held that if temporary injunction results in giving possession of a part of an ejmali property held by the members of the same family to a stranger, then it should not be granted without first specifying the land; a stranger transferee cannot be put in joint possession of an ejmali property with the family members as such procedure would be inconvenient and lead to breach of peace. A purchaser-plaintiff has no right to put a restraint by way of injunction upon other cosharers in specific possession to enjoy their share the way they think best. An injunction may issue to restrain a party when the property in suit is in anger of being wrongfully sold in execution of a decree. Thus no injunction can issue restraining execution of a decree of eviction as in cannot be said that the property is in danger of being wrongfully sold in execution of the decree.” Where a part)- obtains a decree in execution of which the property was being sold, the judgment-debtor cannot get an injunction in a suit filed by him for declaration that the decree was not binding on him as the decree-holder has a right to execute the decree until the decree is set aside.” But where A obtains a decree against B and attaches or otherwise proceeds against a property belonging to C and C thereafter files a suit for declaration of his right thereto and prays for temporary injunction, an injunction may issue as this is a case of wrongful sale of the property in execution of a decree. A decree which prima facie appears to be illegal or void can be construed as causing injury and the court can issue injunction restraining its execution. In granting injunction restraining sale in execution, the court should exercise its discretion cautiously and wisely and see that the machinery of the court is not used for fraudulent purpose. A court is not debarred from passing the order of injunction restraining a party from executing a decree merely because the decree is of a court of superior grade. An injunction can be granted to restrain a threatened disposal of movable or immovable property in fraud of creditors. It can be granted even in a suit for money where the court is satisfied that the defendant threatens or intends to remove or dispose of his property which is wholly outside the scope of the suit. The plaintiff, of course, will have to prove by definite evidence the threat or intention to remove or dispose of the property to defraud the creditors. The court should always be cautious and slow in interfering with the functioning of elective institutions and should be watchful not to allow abuse of the process of the court by persons who want to nullify the result of an election with the aid of an interim order of the court. Pending a suit, the court can issue an injunction restraining the commission of any act which will involve a breach of the contract. But no injunction can issue when the breach of contract has already been committed. In order to obtain the injunction order, the applicant must satisfy the court that he has a completed contract under which he has acquired a right. An injunction cannot be granted where the contract is not enforceable or when it is illegal. It is an important qualification that a party is not entitled to an order of injunction restraining breach of a contract when he is not going to suffer an irreparable loss, or in other words, is not going to suffer a loss which cannot be compensated in monetary terms. Explanation to s.12 of the Specific Relief Act proclaims that unless the contrary is proved, the court shall presume that the breach of contract to transfer immovable property cannot be adequately relieved by compensation in money. Hence, temporary injunction restraining the breach of such a contract can be passed. No injunction can be issued to restrain breach of a contract which cannot be specifically enforced. Thus a contract of personal service not being specifically enforceable, no injunction can issue to restrain the employer from terminating the service of the employee. In the same way no injunction can issue in respect of a revocable license or a contract of agency. However, breach of a negative covenant, express or implied, in a contract of sale of goods can be restrained by injunction. Where parties have agreed that a suit relating to certain matter should be brought in a particular court within the country, an injunction may issue to restrain filing the suit in any other court. In a suit by the highest bidder for declaration that acceptance of the tender of the bidder quoting lesser amount was illegal and for permanent injunction, the lower court passed an order for maintenance of status quo which was treated to be an order of injunction and the Appellate Division held that the highest bidder had no actionable right to be entitled to an order of injunction. The Appellate Division observed, “Had it been the case that the tender was accepted in violation of a condition which has been mentioned in the tender form, then an argument could be advanced for seeking the protection of the inchoate right of the tenderer.” But in Umme Kawsar v. Shams Corporation the court held that the above observation “did not decide any point, but merely refers to the possibility of raising an argument for protecting such right of a tenderer if he has only been able to prove that some conditions laid down in the tender notice has been violated prior to accepting the same.” In the subsequent case of Mozher Sowdagar v. Zahirul Alam 10 DLR the Appellate Division upheld that order of the High Court Division setting aside the order of temporary injunction stating, “Even if it were the highest offer, he by that offer did not acquire any right t purchase the vessel, as his offer was not accepted by the Corporation which reserved full power to reject offer, and no agreement was concluded with him.” But there has been shift from this position and the Appellate Division upheld the declaration of illegality by the High Court Division at the instance of a tenderer when another tenderer’s bid was held responsive in violation of the tender terms. In similar situation, a tenderer may seek invalidity of the action of the authority inviting tender on the ground of violation of tender terms and press for an order of temporary injunction. In matters of employment where the rule of master and servant is applicable the master has the general right to terminate the services of his employee unless the latter can show that the contract contained a term under which the master gave up his right. Even though the applicant may have an arguable case, the employer having the inherent right to dispense with the services of the employee no injunction can issue. The relationship being essentially a contractual one, the remedy of the employee is by way of a suit for damages in case of wrongful termination. As such no injunction can be issued forcing the employer to keep the employee in service. There is, however, an exception to the rule where there is a negative covenant within the meaning of s.57 of the Specific Relief Act in which case the court can grant temporary injunction in an appropriate case. No prohibitory order can be passed by a court to interfere with normal banking transactions and with the contract obligation of the bank where the only dispute is as to the performance of the contract and the dispute can be resolved by a suit for damages. When money is deposited with a bank, its withdrawal is governed by the terms of the contract and the bank is bound to comply with the conditions of the contract and no injunction can issue preventing operation of the bank account. It is fairly well settled that the courts are reluctant to interfere with international business transactions which have been entered into by the parties through performance guarantee or letter of guarantee.Bank guarantee or letter of credit is given by a banker at the instance of one of the parties to, and pursuant to the terms of, the main contract. Generally speaking, no injunction can be issued to restrain the bank from making payment under an unconditional bank guarantee or an irrevocable letter of credit. There is a distinction between the terms of the bank guarantee or letter of credit and the terms of the underlying contract between two parties with which the banker is not concerned. Once the conditions of the bank guarantee or the letter of credit are fulfilled, the bank has nothing to do with the performance or non-performance of the underlying contract. A bank issuing a bank guarantee or letter of credit is not concerned with the underlying contract between the buyer and seller or between employer and the contractor; the bank guarantee or letter of credit constitutes an independent contract between the bank and the party in whose favour it is issued. Where the State Trading Corporation entered into agreement with a foreign buyer to sell goods which the Corporation was to obtain from a local supplier for which the local supplier furnished a bank guarantee, but the contract failed because of the default of the local supplier, the enforcement of the bank guarantee cannot be stopped by injunction. The general rule is subject to the exception that such bank guarantee or letter of credit can be stopped by injunction on the bank only in case of fraud of which the bank has clear notice or when there is special equity justifying such injunction. But no injunction can be granted in international business transaction merely on allegation of fraud.Banks cannot be made to act as policeman to police upon any kind of fraud in international transaction; no re-imbursement should be stopped by any court when an authorised or negotiating bank makes any payment to a third party on the basis of papers appearing to be correct. Where the beneficiary of the bank guarantee or letter of credit has perpetrated fraud when the bank guarantee is sought to be invoked despite the contractor withdrew his bid before acceptance, there results no formation of contract and injunction can be issued to restrain the bank from making payment under the bank guarantee.Where the buyer did not take steps to add confirmation to the letter of credit as required by the contract of purchase and the buyer en cashed the bank guarantee furnished as performance bond, mandatory injunction was issued for return of the amount of the guarantee to the bank which issued it. Cases involving allegations of misrepresentation or suppression of material facts or violation of the terms of the guarantee cannot be treated differently and as such where there are allegations of such nature the court would not hesitate to grant injunction. Where the plaintiff received part of contracted goods and the balance was not supplied and the documents were negotiated beyond the stipulated time, the plaintiff is entitled to injunction restraining payment under the letter of credit for the portion not supplied. The question arises whether the issuing bank is liable to make payment when the issuing bank comes to know about the fraud after it accepted the draft in a case where the letter of credit provided for deferred payment and in the meanwhile the negotiating bank made payment to the beneficiary of the letter of credit on acceptance of the draft by the issuing bank. In Korea Exchange Bank v. Gemini Garments the negotiating bank made payment on discrepant documents and then sent it to the issuing bank which accepted the draft, but the fraud perpetrated by the beneficiary of the letter of credit was found out and the High Court Division after examining a number of cases from local as well as foreign jurisdictions found that the negotiating bank was a collecting bank and it having made payment before the acceptance by the issuing bank could not be treated as holder in due course and the issuing bank could not be compelled to make payment to the negotiating bank. The High Court Division further found that the beneficiary having been found to be a bankrupt, Korea Exchange Bank would have no right to payment since its principal forfeited its right to such payment and such payment would result in irretrievable injustice. Where the bank has no notice of the fraud perpetrated by the drawer of the bill of exchange, payment to the holder in due course of the bill of exchange under a letter of credit cannot be restrained by injunction. Banker’s letter of indemnity stands in the same position with bank guarantee or letter of credit. The court should not interfere in a transaction between a bank and a beneficiary of a letter of indemnity by grant of injunction at the instance of the other party restraining the beneficiary from enforcing the liability under the letter of indemnity executed by the banker which was absolute and upon a demand being made by the beneficiary, the bank becomes liable to honour the same regardless of any controversy between the parties. Where the plaintiff auction purchased a tannery and upon a dispute relating to reduction of the price filed a suit for declaration of his entitlement to a remission of the price on account of failure of the government to deliver the full quantum of land, temporary injunction in prohibitive and mandatory form relating to possession was refused as the suit was declaratory one and not in respect of possession. As temporary injunctions are granted to protect the interest of the applicant till his rights are finally adjudicated upon, the court has inherent jurisdiction to grant interim injunction even when the case does not fall within the terms of rule l and 2. Thus where in a dispute the well-being and economy of several villages appear to be involved and are likely to be in jeopardy if a proposed khal is allowed to be excavated or water is allowed to be bailed out, temporary injunction may be granted to restrain such acts and the mere plea that the impugned order affected lands outside the suit plots would not invalidate the order.Injunction restraining the defendant from interfering with possession of the plaintiff who was sued for specific performance can be granted when the agreement sought to be enforced recites delivery of possession to the plaintiff. The court can in exercise of its inherent jurisdiction issue temporary injunction restraining execution of a decree alleged to have been obtained by fraud or pass an order of mandatory injunction to restore status quo ante Where in partition suit , the Subordinate Judge while keeping the matter of temporary injunction pending passed an order permitting opposite party to make construction of a multi-storied building in exercise of inherent power, the High Court Division found the exercise of the power to be fanciful. In a case it was held that a receiver cannot be appointed in an application for injunction as the words “make such other order” do cover such case. However, in other cases, it has been held that there is nothing in the rules prohibiting such appointment and a receiver may be appointed if the circumstances of the case so require. The latter view seems to be correct. Thus where temporary injunction was passed by the trial court resulting in a void, the High Court Division approved the order of the appellate court appointing a receiver. Where the question of possession of a land in dispute is doubtful the proper course is to appoint a receiver till the disposal of the question pending before the civil court. b) remove any person form possession or custody of the property. d) confer upon the receiver all such power, as to bringing and defending suits and for the realization, management, protection, preservation and improvement of the property, the collection of the rents and profits, and the execution of documents as the owner himself has, or such of those powers as the Court thinks fit. k) Where the applicant has no personal interest in the matter. Where a statute prohibits entertainment of a suit, application or other legal proceeding for an order of injunction, no temporary injunction can be issued. If an application for temporary injunction has been rejected, another application for injunction on the same grounds will not be entertained, though the principle of res judicata is not applicable in respect of applications for injunction, as it amounts to abuse of the process of the court. But where the application for injunction has been dismissed for default, there is no legal hurdle in the way of renewing the application. However, if the fresh application for injunction is made on the facts and circumstances which are different from those which existed earlier and relied on, the subsequent application may be considered by the court in the light of the changed circumstances. Apart from punishing a party for violation of the order of injunction, the court can pass order for restoration of the status quo ante. A sale held in execution of a decree in violation of an order injunction restraining the execution of decree may be set aside under inherent power. When the defendant has, in violation of the order of injunction, dispossessed the plaintiff from the suit property during the pendency of the suit, the court has the authority and duty to restore possession to the plaintiff by evicting the defendant in exercise of inherent power. An appeal lies from an order granting or refusing temporary injunction. Appeal will lie against an order refusing temporary injunction without issuing notice under order-3 of CPC an revision against such order is not maintainable. But no appeal lies from an order merely issuing notice to show cause. However, an appeal shall lie when with the order to show cause, an order of ad-interim injunction is passed as it will be an order under rule 1 or 2 of CPC. But in Abdul Jalil v. AB Siddique 21 DLR the Appellate Division deprecated the procedure of filing appeal against interim injunction and the decision suggests that instead of filing appeal or application under r.4, the aggrieved party should file written objection and have the matter of temporary injunction heard. Question arises whether an appeal lie when the court ordered issuance of notice to show cause, but refused to grant ad-interim temporary injunction. As because the matter of granting injunction remains open, no appeal should lie, but the aggrieved party may file revision against the refusal to grant ad-interim temporary injunction. An appeal being maintainable against an order passed under r. l and 2, an order passed under r.2 (3) punishing or refusing to punish violation of injunction is appealable. No appeal shall lie when the court grants temporary injunction in exercise of power under s.151 of CPC and in such case the aggrieved party may file a revision. Where a revision is filed bona fide when the impugned order is appealable, the revisional application is treated as a memorandum of miscellaneous appeal. But where the appeal lies before the District Judge against an order granting or refusing temporary injunction. A party bound by the order of injunction may be proceeded against under r.2(3) for violation of the order of injunction. No one can be guilty of disobedience of an order of injunction except the person to whom it is directed.1 Hence a person not party to the proceedings at the stage of passing the order of Injunction and confirming of status quo cannot be punished under r.2(3). A person who claims under a party bound by the order of injunction may be proceeded against for violation of the order of injunction. Where employee or agent of the person against whom the injunction is issued commits breach of injunction, the principal be liable; merely because the offending act has been done by the employee or agent of the party injuncted, it cannot be a defence for committing breach of the order of injunction. State is a person and is liable to be proceeded against for disobedience of the order injunction.’ The officers of the government may be proceeded against for disobedience even though they may not be parties to the suit.’ A party restrained by injunction may be liable for contempt when in violation of the order of injunction he delivered paddy to the mill on the order of the procurement officer as the order of the court must prevail over any executive order. A person who has been restrained by an order of injunction cannot disobey the order by asserting that he has got a new capacity different from the one in which he was restrained. An injunction is essentially a disability against him and the fact that his capacity is changed is no justification for his disobedience. A person is liable for violation of order of injunction when he has notice of the order. It is not always safe to rely upon the report of service on record to hold that notice has been served, particularly when the report itself discloses that service was by affixation. In such circumstance, the serving peon should at least be called. Before punishing a person for disobedience, he must be given opportunity to prove that he did not receive notice before the act of violation. However, when the order of injunction was passed in presence of the lawyers of both sides, the order of injunction must be presumed to have been communicated to the party affected thereby and it is no excuse for that party to say that the order was not communicated to him personally. Proceeding for violation of an order of injunction partakes of a quasi-criminal nature and the court in such proceeding should frame issue disclosing material particulars constituting the offence so that the person charged may be put on his guard as to his defence. Proof of violation by production of evidence is necessary and the person proceeded against should also be given an opportunity to prove the contrary. Where the court passed an order to maintain status quo with respect to certain property without making the ad interim order of injunction absolute, it is the duty of the court to come to a positive finding regarding possession in respect that property before punishing any one for disobedience of the order passed by the court.Before ordering demolition of any construction, the court should record a finding that the construction was set up and to the extent after passing of the order of injunction. A person may not be liable to be punished if he has acted in good faith and without any intention to violate the order of injunction. A party cannot be held to have willfully disobeyed the order of injunction if it is seen that the order was ambiguous and reasonably capable of two interpretations and the party did not intend to disobey the order, but conducted himself in accordance with his interpretation of the order. The question whether the party has understood the order in a particular manner and has acted accordance with such an interpretation is basically one of fact and if the materials before the court do not support such a state of affairs, the court cannot attribute an innocent intention based on presumptions, for the only reason, that ingenuity of the counsel can discover equivocation in the order which is sought to be enforced. A party restrained by an order from disturbing possession of the plaintiff cannot take the stand that he has been in possession from before the order of injunction which implies a judicial finding that he was not in possession. Where an injunction is operative, a party cannot disobey it on the strength of an order under s.145 of the Code of Civil Procedure; he is required to bring the order of the Criminal Court to the notice of the Civil Court for reconsideration of the order of injunction, but so long as the order of injunction is operative, the finding of the Criminal Court is of no consequence. An injunction, although subsequently discharged because the plaintiffs case failed, must be obeyed while it lasts. However, where an act has already been done before the injunction order has been issued; there can be no punishment for disobedience. The court which passed the order of injunction has the power to punish disobedience of the order. Question arises whether a court to which the suit is transferred after the order of injunction was passed can exercise the power under sub-rule (3) of r.2. Referring to s.150 of the Code, the Appellate Division held that the transferee court which is in of the suit can exercise that power. The Appellate Court has the same power to order punishment as the original court. For disobedience of an injunction order the court may order arrest of the party in violation or attach his property. The court is not bound in the first instance to attach the property and then order imprisonment. In Azizul Haq v. Anwara Khanum, 22 DLR the defendant was sentenced to imprisonment for five days, but the High Court Division modified the punishment on the prayer of the defendant to fine of Tk.500/-. It is submitted that the law has prescribed the punishment keeping in view the requirement of undoing the wrong which cannot be achieved by changing the punishment to one of fine and the legislature advisedly specifying the punishment, the court ought not to have awarded a punishment not sanctioned by the relevant law. Any willful violation or disregard of the order of the court is a matter of serious concern for the society and the wrong-doers must be adequately punished in accordance with law, otherwise the dignity of the court and majesty of the law will be seriously impaired. The Defendant’s claim that he is the owner of the land will not be a valid defence to the suit that has been filed against him under s.9 of SRA 1877. In fact, it is irrelevant as to who the owner of the land is for the purposes of a suit under s.9. What is important is who was in possession at the time of the dispossession. Even though the person in possession is not the true owner of the property, he may not be dispossessed by the real owner without due recourse to the law. The Defendant’s claim of ownership will not prevent my client from repossessing the property. The Defendant can however file a suit according to the first proviso to s.9 to establish his title to the property and recover his possession thereof. In this respect, a suit may be filed by the Defendant pursuant to ss. 8 and 42 of SRA 1877. Rationale of s.9 is to prevent the owner of land from taking the law into his own hands. Now, add own points including case law as to why it does not matter for the purposes of s.9 even if the real owner of land wanted to dispossess the person in possession who does not have title to the land. The Court cannot compel specific performance of the contract requiring Rina to sing at the private law college in Dhaka. This is because s.21(b) of SRA 1877 provides that a Court will not specifically enforce a contract which runs into very minute and numerous details or which is very much dependant on the personal qualifications or volition of any of the parties. In this case, the contract for singing at the private law college in Dhaka depended totally on the personal skills/qualification and/or volition of the parties and accordingly cannot be enforced (s.21(b) SRA 1877). However, on the basis of s.57 of SRA 1877, whilst it may not be possible to force Rina to sing at the private law college, it may be possible to prevent her from singing at the BTV programme. S.57 provides that where a contract consists of an affirmative agreement to do a certain act and a negative agreement, express or implied, not to do a certain act, the circumstance that the Court is unable to compel specific performance of the affirmative agreement will not preclude it from granting an injunction to perform the negative agreement (provided that the applicant, the college in this case, has not failed to perform the contract so far as it is binding on it). Now, it can be said that there was an implied term in the contract between Rina and the LawCollege that during the period of the contract, Rina would not sing for any other organisation. Accordingly, on the basis of s.57, it is possible for the Court to grant an injunction to prevent Rina from singing at the BTV programme. Also, under s.65 of the Contract Act 1872, when an agreement is void, the person who has received any advance under such agreement is bound to restore it or compensate the person from whom he received it. So, Tk. 25,000 has to be returned to the college. That a contract was entered into between the 1st Defendant and the law college whereby the 1st Defendant offered to sing for a Charity Show for 1 week in aid of the college. That the show was scheduled to be held on 1st November 2003 in relation to which the 1st Defendant received an advance of Tk. 25,000 from the college. That on the 5th October 2003, the Plaintiff received a letter from the 1st Defendant that she would not be able to perform at the Charity Show as she was scheduled to sing at BTV’s special sponsorship programme on the same day. That the 1st Defendant intends to sing at BTV by breaking the terms of the contract with the Plaintiff. That the Plaintiff has made extensive preparations and undergone huge expenses in relation to the show to be held on 1st November 2003. That if the 1st Defendant fails to perform at the college on the day, then the Plaintiff is going to suffer irreparable loss. That it is in the interests of justice that an injunction be granted preventing Rina from singing at the BTV programme on the 1st November 2003. Wherefore it is humbly prayed that your honour would graciously be pleased to grant an injunction preventing the 1st Defendant from singing at the BTV programme on the 1stNovember 2003 and make such other orders at it considers fit and proper. For this act of kindness, the Plaintiff as in duty bound shall ever pray. That the statements made above are true to the best of my knowledge and are matters of record in witness whereof I have signed this verification on this 10th day of October 2003 sitting in the chamber of my Advocate. Rahima should file a suit under s.9 of SRA 1877. S.9 provides that where a person has been dispossessed of immovable property without her consent, otherwise than in the due course of law, then a suit may be instituted in order to recover possession of the property notwithstanding any other title that may be set up in the suit. Accordingly, given that she had forcibly been deprived of possession, she should file a suit under s.9 SRA 1877 in order to repossess the land. The Defendant, Akbar Ali’s claim to ownership of the property is irrelevant: this is because for the purpose of filing a suit under s.9, what is important is who was in possession and not who was in ownership. Even if Rahima is not the owner of the property, the fact that she was in possession of the land at the time of the unlawful dispossession would allow her to repossess the land under s.9 SRA 1877. That the Plaintiff is a poor, deprived but honest lady. That the Defendant is a known criminal and a rich and powerful neighbour of the Plaintiff. That the Plaintiff was in possession of 4 decimals of land as described in the schedule and she had been in such possession for the last 15 year until 10th January 2002 when she was dispossessed by the Defendant. That on 10th January, 2002 at about 11 AM, the Defendant forcibly entered the Plaintiff’s premises leading a team of 4 mastans and took possession of the land, shoved her out of the land and threatened to kill her if she came back again. That the dispossession was otherwise than in the due course of law. That the suit filed by the Plaintiff within 6 months of the date of dispossession. That the relevant court fees have been paid. That if the Plaintiff were not allowed to repossess the land, she would suffer irreparable loss. That it is in the interests of justice that she be allowed to recover possession of the land. Wherefore, it is humbly prayed that your honour would graciously be pleased to make an order restoring the possession of the property as mentioned in the schedule to the Plaintiff and to make such other order that your honour would deem fit and proper. That the statements made above are true to the best of my knowledge and are matters of record in witness whereof I have signed this verification on this 26th day of March 2005 sitting in the chamber of my Advocate. Kalimullah was disposed of his land by his neighbour, otherwise than in the due course of law and without his consent. Accordingly, Kalimullah should have filed a suit under s.9 of the Specific Relief Act 1877 for recovery of possession of the land. s.9 of SRA 1877 states that when a person is dispossessed of immovable property without his consent and otherwise than in the due course of law, then he may file a suit for recovery of possession thereof, notwithstanding any other title that may be set up in such suit. Alternatively, Kalimullah could have pursuant to s.8 of SRA 18787 attempted to recover possession of the property in accordance with the procedure set out in CPC 1908. Then he could have sought a declaration as to his right to the property by filing a suit against his neighbour and the Court in its discretion could have made such a declaration. However, instead of following either procedure, Kalimullah only sought declaration of title without prayer for recovery of possession. Such a suit is not maintainable in law for the proviso to s.42 SRA 1877 clearly states that where there is any other remedy available to a person and he omits to seek such relief, then a Court will not make a declaration under s.42. Here, Kalimullah has failed to make use of the procedure in s.8 and s.9 for recovery of possession and therefore the Court would not make a declaration under s.42. The fact that the Defendant is claiming that he is the rightful owner of the land is irrelevant for the purpose of bringing a successful suit against the Defendant. Under s.9 1877 Act. According to s.21(a)(?) and (b) SRA 1877, contract with Arambagh Sporting Club is not specifically enforceable. However, contract with ASC can be divided into 2 parts namely: i) affirmative agreement to play for ASC and ii) implied negative agreement not to play for any other club during this period. While i) cannot be enforced, courts can enforce ii) under s.57 SRA 1877. S.57 provides that where a contract consists of an affirmative agreement to do a certain act and a negative agreement, express or implied, not to do a certain act, the circumstance that the Court is unable to compel specific performance of the affirmative agreement will not preclude it from granting an injunction to perform the negative agreement (provided that the applicant, ASC in this case, has not failed to perform the contract so far as it is binding on it). Remedy for ASC in this case would be an injunction preventing the player from playing for any other club. Mr. Jalil’s leg injury: He may not be able to play for ASC. But once injunction us granted preventing him from playing for Wari Club, this will not suffuce as an excuse for playing for Wari. Also, under s.65 of the Contract Act 1872, when an agreement is void, the person who has received any advance under such agreement is bound to restore it or make compensation for it.So, if Mr. Jalil has taken any advance from ASC for this contract, he is bound to return it to ASC. That the Plaintiff is a teacher of RangpurCollege where he has served with the utmost sincerity and dedication for the last 15 years. That on account of the Plaintiff’s popularity in RangpurCollege, his contract with the college has been renewed 3 times over the last 15 years. That on Thursday, 19 August 2001, the governing body of RangpurCollege by a resolution dismissed the Plaintiff from service allegedly on account of his insubordination. That the governing body of the college passed the resolution in excess of its powers and in a manner that was unlawful and that such resolution was accordingly illegal and void. That in view of the illegality of the resolution, the Plaintiff has instituted a suit under s.42 of SRA 1877 challenging the legality of the resolution. That until the disposal of the suit instituted by the Plaintiff under s.42 of SRA 1877, a temporary injunction restraining the Defendants from giving effect to the resolution ought granted in the interests of justice. That if such an injunction is not granted and the Plaintiff is dismissed from service, then he is going to suffer not only financial loss but also loss of reputation. Wherefore, it is humbly prayed that your honour would graciously be pleased to grant an injunction preventing the resolution from being implemented. That I am the Plaintiff of the suit and as such competent to swear this affidavit. That the statements made above are true to the best of my knowledge and belief. According to CPC in case of procedure, the court shall in all cases, before granting an injunction, direct notice of the application for the same to be given to the opposite party and be satisfied that notice has been duly served, or could not be served on account of refusal by the opposite party of receive, otherwise. Court shall not, without serving reasonable notice to the government pleader and giving him or any pleader authorized by him in that behalf an opportunity of being heard, pass ex party any order of ad interim or temporary injunction under any of the aforesaid rules of this order at the instance of a private party against the government or any statutory public authority. Above the discussion, it is clear that there have major discrimination between government and general public. Because, in case of general public giving notice is not mandatory. But in case of government there must be giving notice. Here in emergency case the party may be deprived even destroyed and here clearly law is not equal for everyone. So, that provision must be amendment for betterment of people. Judges must be 6 decrees in a month. But injunction order does not consider as a decree. So they are not interested about that judgment. For end of justice this order should be included about subjected that 6 decree. The procedure of injunction petition just like original case. So here a large time is west by that process and original case is deprived. For betterment of legal procedure here some information is very necessary. It is a well settled principle of law that interim relief can always be granted in the aid of and as ancillary to the main relief available to the party on final determination of his rights in a suit or any other proceeding. Therefore, a court undoubtedly possesses the power to grant interim relief during the pendency of the suit. Injunctions are thus injunctions issued during the pendency of proceedings.